It's mind-boggling to think about how much the industry has changed in just four years. And even at that, there are many professionals (maybe even you) who aren't clear on what "inbound marketing" really is. 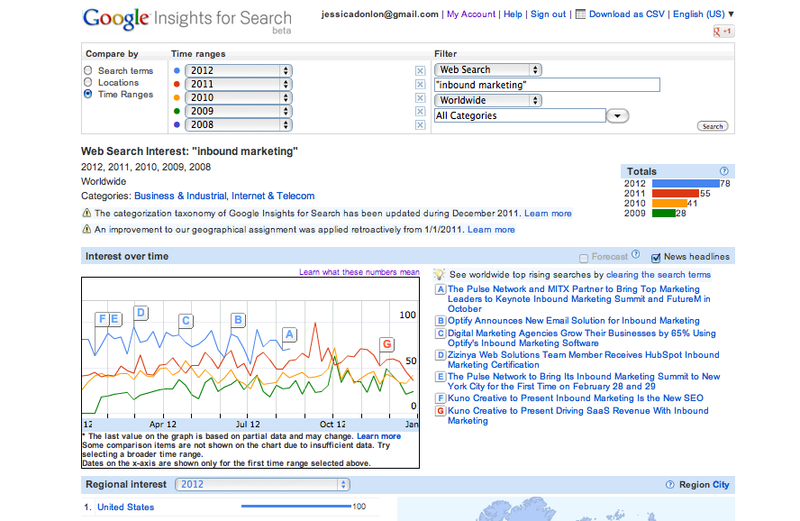 Google Insights for Search, showing worldwide search frequency for "inbound marketing" from 2008 through today. As such, I’ve been reflecting lately on our path from PR firm to inbound marketing agency, as well as the relationships we’ve built with HubSpotters, fellow HubSpot partners and users, and friends in the Boston area and beyond. So, let’s take a trip down memory lane. Following are some of our most popular bits of content that detail PR 20/20’s philosophy and approach to inbound marketing, as well as how we became a certified HubSpot partner agency. Written by PR 20/20 founder and CEO, Paul Roetzer (@paulroetzer), in September 2008, shortly after we returned from our first Inbound Marketing Summit. In it, he calls for change in the PR industry, and encourages fellow professionals to move toward inbound strategy, processes and services. “The PR industry is in the midst of an identity crisis… In a wildly competitive and cluttered media landscape, one that is increasingly being dominated by the social Web of mass collaboration, consumer-generated content and social networks, innovative PR firms are emerging to meet growing demand for Internet-based expertise and services. Our first ebook, written by Paul in January 2010, has been downloaded more than 3,500 times to date. Though our process has evolved over the past two-and-a-half years, we still follow a similar approach as the one outlined in the GamePlan, from defining brand, to establishing objectives, to measuring everything and tweaking strategy based on results. In March 2011, Paul revisited the popular “Dawn of” blog post to shed new light on this still-emerging area. This time, he included a profile of the ideal inbound marketing agency, from staff, to services, to infrastructure and more. “Everything is changing: budget allocations, pricing and service models, communication channels, influencers, measurement methods, tools and platforms, higher education, industry accreditation, career paths and organization charts. Paul’s book, published by Wiley in December 2011, presents agency leaders and professionals with 10 rules to build tech-savvy, hybrid agencies that will disrupt and transform the marketing services industry. Paul wrote this guest blog post for Jay Baer (@jaybaer) in February 2012, addressing the talent gap we’re facing in the industry because of shifts in consumer behavior, technology, and marketing intelligence and reporting. “Digital marketing has revolutionized the industry, and the job market. Corporate marketing departments and marketing agencies struggle to recruit and retain qualified professionals for career paths that did not exist three years ago, while academic institutions are faced with the need to adapt curriculums to the real-time nature of business." Our latest ebook, penned by Tracy Lewis (@tracy_j_lewis) in June 2012, explores what’s next in inbound marketing, and how B2B organizations can run impactful, measurable and results-driven programs. We have some cool projects up our sleeves for the remainder of the year and into 2013, including Net Marketing Score (@NMScore), some new B2B marketing ebooks, a forthcoming client services series over at Marketing Agency Insider (@agencyin) and more. I often tell people that although the marketing industry is tumultuous these days, it’s an exciting time to be in the business. I believe that’s especially true at an organization that’s driven to push the envelope, like PR 20/20. Please stay tuned, and stay in touch. Oh, and did you know we’re hiring?